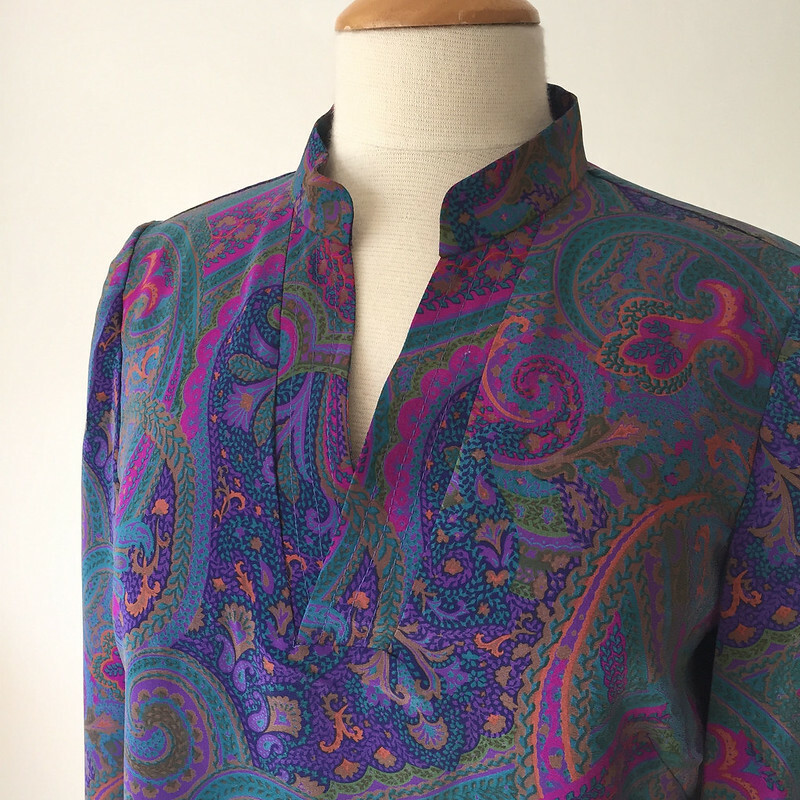 It's time for another Pattern Whisperer post and this time I have blouses on my mind. By this I mean a top or blouse that you probably wouldn't wear to work. Not something tailored or businesslike, but a blouse that you can pair with some elegant trousers or sleek ankle length pants and be ready for a party or get-together. Most years I gravitate to dresses for holiday events but this year I am just in the mood for separates. So here goes with some ideas for blouses. This time of year can turn into sewing crunch time - if you are like me you might be stitching a few gifts plus trying to make a special occasion outfit. With that thought I have tried to select patterns that will be quick to fit and sew but also can look a little bit special (i.e. not office wear). 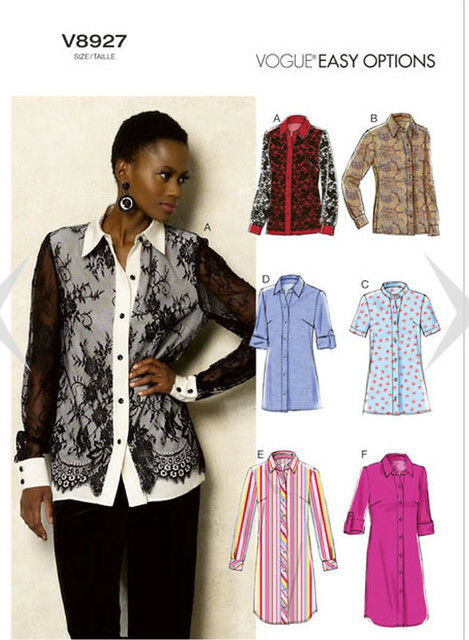 This type of shirt or blouse is all about the fabric. Some of these patterns work with a variety of fabrics but for a dressy version think about using silk charmeuse, poly charmeuse, chiffon, metallics or even sequins. This year seems to be all about the bows, ties and interesting sleeves. I love seeing how styles circulate - a lot of the current patterns seem to be revisiting styles from earlier decades. Which proves that there is very little that is new in fashion, right? To start - I think a lot of people will buy this pattern. 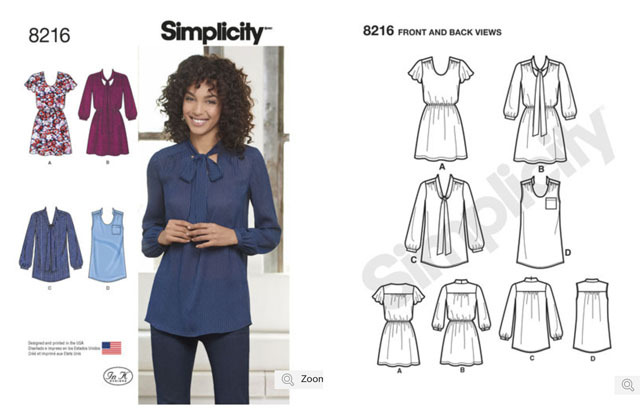 Simplicity 8216. For one thing it is a good value for your money, with both a blouse and a dress version. You can make it any length, it has the neck tie which is all over now and would be really pretty in a sheer fabric. In fact I just sewed a blouse with this type of neck tie (doing a little pattern work on my standard shirt pattern) and I made the tie too wide so it looks weird and I am scrapping the whole thing, and repurposing it into something else. But anyway - this one is cute and I think would sew up fast. You could leave off the elastic in the long sleeves for a different look if you aren't into the gathered sleeve. 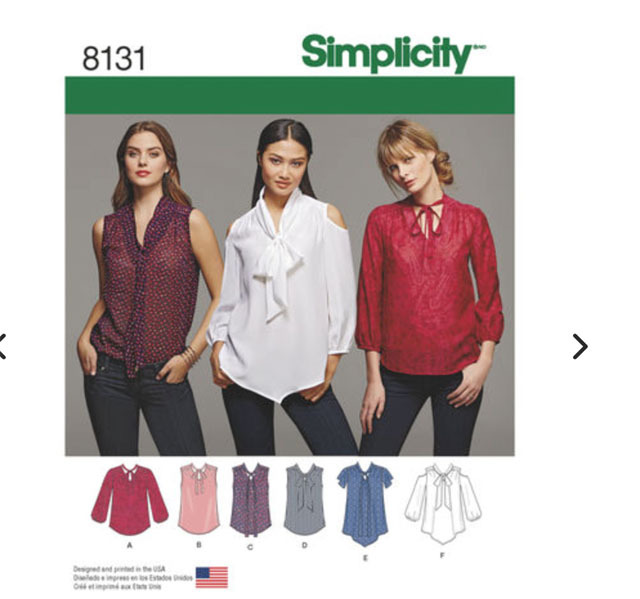 Here's another Simplicity 8131 that is similar but with two versions of the neck tie, and also the cold shoulder look that is really popular now. There are a lot of patterns for that look if you want to sew that. I actually think it would be quite easy to just convert your sleeve/shirt pattern to have that feature but it is probably easier to buy the pattern as they will have all the instructions for finishing the edge etc. This blouse has no darts but shoulder gathers which I like a lot on blouses. Again, lightweight or sheer fabrics would be really nice for this one. Another good thing about most Simplicity patterns is that their size range covers from 6 - 22. Just to show that there is not a lot new with sewing patterns, I was looking on Etsy for a blouse pattern (I had a specific thing in mind but it was not in any of the current pattern offerings) and came across this Vogue patterns. Their patterns from a while ago didn't always include the full range of sizes but they seem to have improved a lot in the last few years and print the patterns in all sizes. However I came across this one which was in the 20-24 size. Super cute and 3 different blouses in one envelope. 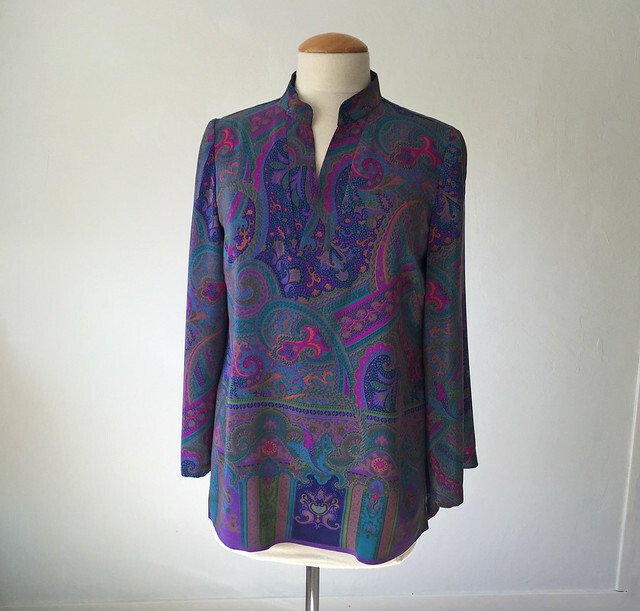 There was just this one available last week - could be sold by now but it would be worth looking out for if it is your size. As I mentioned, there are a ton of these cold shoulder tops around now so here is a Butterick that also has a couple of different views. I think this one would have to be all about the fabric, as the pattern is a bit of a snooze. 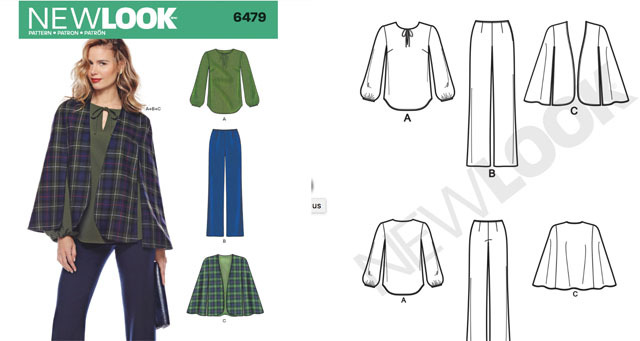 Butterick 5889. But you could make the plain t-shirt version in a metallic stripe, that would be very cute. Also if you had a border print that would work. The other version with the buttons also would be interesting in the right fabric, paired with very slim pants. This year I have been happy to find some hidden gems among the New Look patterns. Which at a price of $ 4.00 I always take a good look at. Are they also priced lower than other patterns outside the US? just curious. This one is all about the sleeves - I like the View C version sleeves and then the View B neckline. That is a great feature about these New Look patterns, they give you so many options in one envelope although it can be a bit of a puzzle to find all the pattern pieces and work out the yardage. 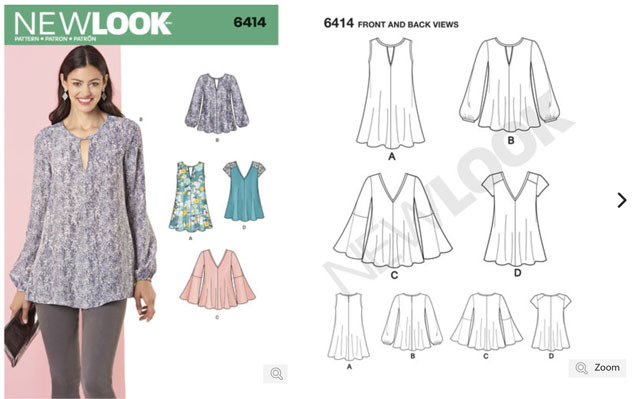 You could also use a contrast fabric or lace on the yoke in view D. They must have a big stash of seriously drab fabrics at the New Look headquarters as they seem to sew up a lot of the samples in really uninspiring fabrics. New Look 6414. Here's one out of left field (baseball reference for my overseas readers). Hot Patterns 1196, I don't usually look at the pattern companies other than McVoguerick, Simplicity/NewLook and Burda. But I saw a couple of versions of this one during the past year and filed it away in my memory bank for a Pattern Whisperer post. They show it here looking a bit summery with white pants but I think it could work as well for a holiday event in a rich shimmery jewel tone. And it looks glamorous yet allows you to eat all the party fare you want. Call that a win! They indicate it can work in a wide variety of fabrics, both knits and wovens. Remember I said it is all about the fabric? 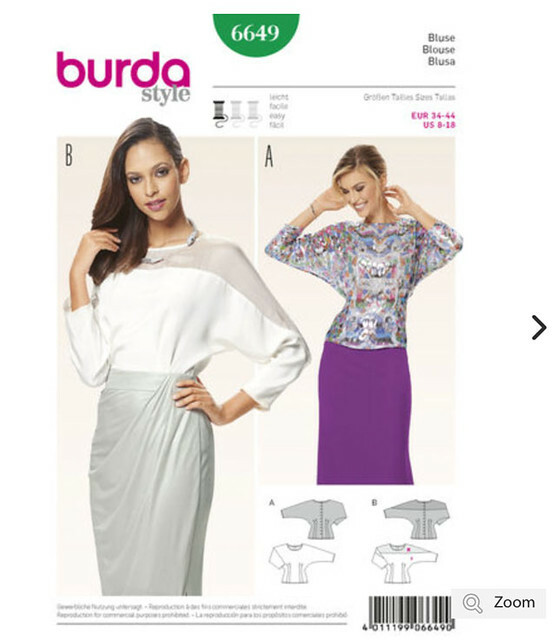 This one Burda 6649 envelope pattern is perfect for some interesting choices and I could see it working in lace, sheer fabrics or even two colors of silk. I like the release darts for shaping at the waist and it looks like a super quick top to sew. I think they show buttons down the back but I might change that to a zipper, or even skip the back opening if you could get it over your head and then put in a side seam zipper to keep the fitted look. Here's one that I would sew up if I lived in the southern hemisphere where summer and Christmas happen together (you lucky people !!) This would be so cute in a print as shown or in metallic denim and you could even make the strap sections in a complementary fabric or leather. Also if you made pants in the same fabric it would give you a cool jumpsuit look without the jumpsuit restroom wrangling. 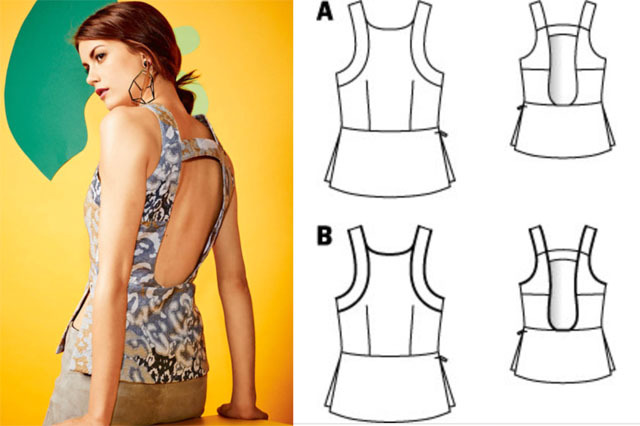 Burda Cutout Back Top 07/2015 # 120A Here's the link. Another from the BurdaStyle website. Here's the link. V-neck blouse Plus size 07/2016 #129A This looks like a nice top to pair with a cute jacket. I love the way the twist as the neckline adds some pretty draping and interest. Also it has bust darts which are good for fitting. The pattern calls for two layers which allows you to play with color/fabric. 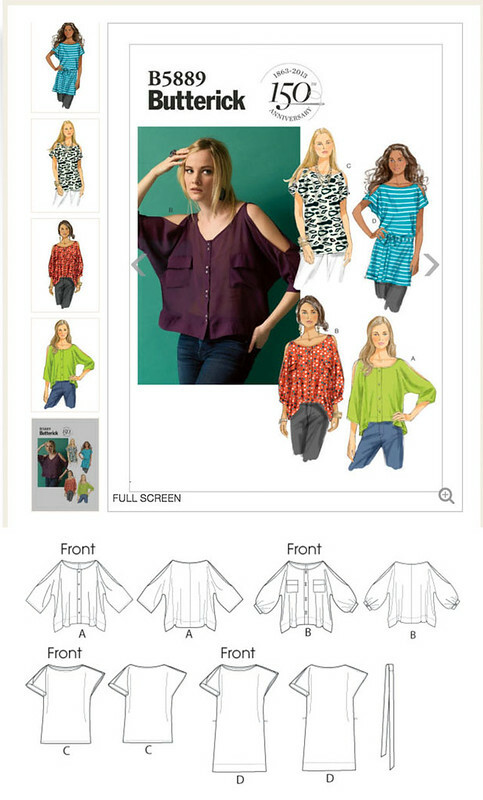 The BurdaStyle website patterns are outstanding for patterns in this size range, I am always surprised I don't see more of them sewn up. Also if you see a pattern but it is not in your size or perhaps has some details you are not sure about - look through the BurdaStyle pdf patterns, so many lookalikes or variations that might be perfect. Granted the instructions are kind of skimpy but I think you could use the instructions or order of construction from a similar pattern or book to get you through it. Lastly this Vogue pattern caught my eye. Vogue 8927. If you like tailored garments but wanted to change it up for a holiday party this one might work for you. There are so many basic shirt patterns out there but this one is designed for the lace overlay which is handy. Giving you the yardage and layout instructions so that you get the lace edge along the bottom as shown. Plus it is a dress as well. 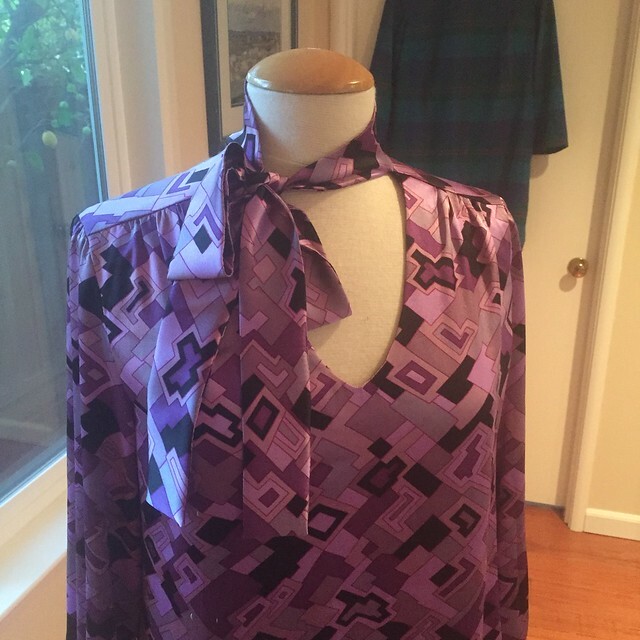 So those are my ideas for this type of blouse - which is kind of a niche category and as I said above, is all about the fabric. Simpler might be better if you are working with a very luxe, expensive or tricky fabric. Choose something where you will have a easy time, enjoy the fabric and don't overdo it on the design. Now it's time for me to issue an apology of sorts to my very first Pattern Whisperer victim. Here's the link to my original post - some good options there still. I say victim because I took requests for a reader for me to choose a pattern for a party dress. And the person who I selected was Rachel of Sew South London, a very good sport who accepted my suggestion of Vogue 1342 Donna Karan dress. 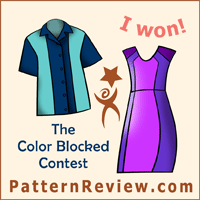 She sewed it up, with some serious pattern puzzling and I think she looked fabulous in it, the color was perfect and the shape was great on her. But I'm going on the record to say whew - that pattern is a doozy! One of my recent sewing students brought that along this dress, well actually a shoebox with the pattern and then cut-out and slightly sewn dress parts. She said she had trouble with it and if we had time after our main project could we take a look at it. We did and it was a real head scratcher. So I told her to leave it here and I would take a look prior to her next lesson. A few days later I woke up full of energy so decided to take the pattern pieces out of the box and start. Whew! that pattern is really something. As many of those Vogue Donna Karan patterns are. It took me about 2 hours of re-marking in color coded tailor's tacks (for small, large and square pattern dots) and then I finally figured out how it went together. So it is on it's way to being stitched up. But Rachel - BRAVO to you for finishing that and wearing it to your party. Sewing baptism by fire on that one. Anyway - a learning lesson for me and my pattern whisperer posts:) Although I still love the Donna Karan Vogue patterns and will eventually own (hoard) them all. I hope this post has given you some ideas for sewing over the long Thanksgiving weekend here - after stuffing ourselves with turkey etc and pie! pie ! pie ! (you can tell what part of the dinner I like) I will hit the gym hard and then do some serious sewing. Particularly as we are supposed to have rain over the weekend - hurrah - and the garden can take care of itself. Sew your stash and stay out of the fabric stores - those black Friday crowds are too much for me. Today's garden photo, here's the view from the window above my sewing machine. 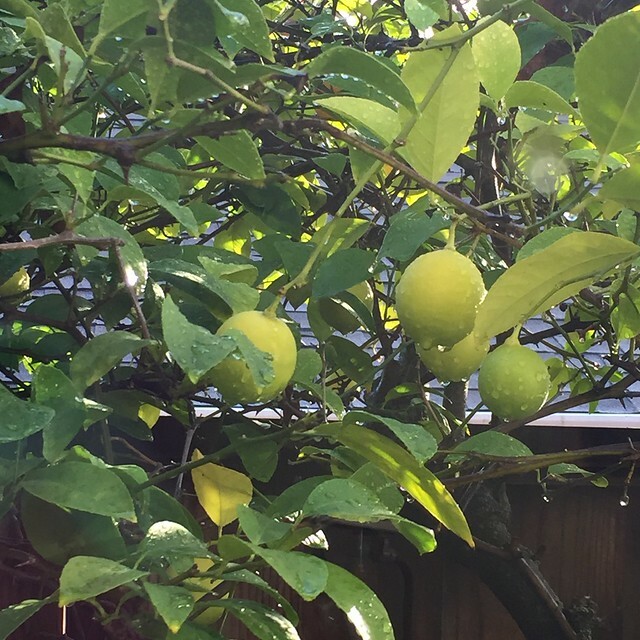 Meyer lemons and raindrops. A good combination. Can you believe Thanksgiving is next week? Somehow once Labor Day is past the year seems to fly by. Which is fine with me - onward to spring! But I will admit, there was a distinct chill yesterday and I thought - oh good - I can wear some of my coats:) The things you focus on when you have a handmade wardrobe, right? 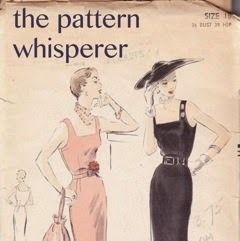 I am working on some Pattern Whisperer posts so stay tuned next week for something in that category. 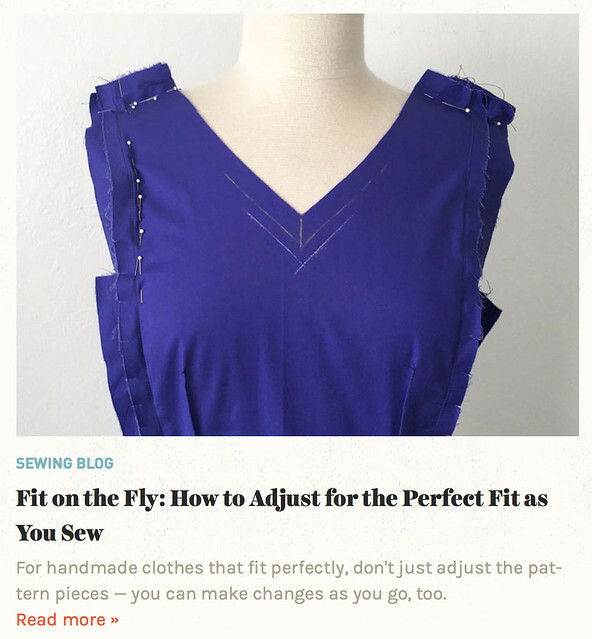 In a different category, I had a couple of new posts on the Craftsy Sewing blog that may be of interest. Links to the posts are above the photos. A topic that is always popular - fitting. And another post that published yesterday, how to make a party dress quickly. You may know my attitude toward some party or formal clothes - instead of treating them as precious garments with every detail inside and out stitched to perfection, I actually think party clothes are one step up from costumes. In that they are slightly ephemeral - often a style or trend that will evaporate - and usually made for limited wear. Anyone agree with my philosophy on sewing formal clothes? Some things you make and you just know they will be in heavy rotation in your wardrobe. 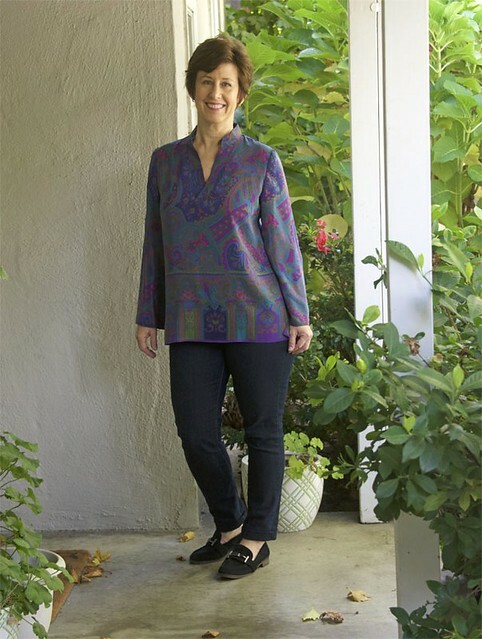 That is the case with this silk tunic top - it has become my favorite item sewn this year. I predict my family and friends will start asking me if I have anything else to wear. But I don't care! I absolutely love it. To make it even sweeter - a very nice friend actually gave me this fabric. Which is a gorgeous heavy silk, with a slightly sueded texture, and a border print too. The same person that gave me the green wool fabric which I just used in the green coat as well as in the tri-color coat. As she mentioned when she asked if I wanted this trove of fabrics "I just want them to go to someone who will enjoy them" which turned out to be the understatement of the year. As evidenced by my smile - fabric love on all counts. This silk piece was about 2 yards and as I mentioned it had a border, only on one selvedge. So I did ponder a while what to do with it and I was really thinking about making a simple dress but then after my successful run of tops this summer I realized I would be able to wear it so much more as a top. As for the pattern - a perfect combination with my year-to-date favorite pattern which is New Look 6677, unfortunately discontinued. For some reason the shape of the top and the way the neck placket and collar are designed fit me perfectly. Although I have only made the tunic version - the other top with the waistband is not my style at all. However a pattern with multiple views - got to give them credit on that score. Most New Look patterns have multiple views or even multiple garments plus all sizes in one envelope - a nice value. A look at the collar and placket. 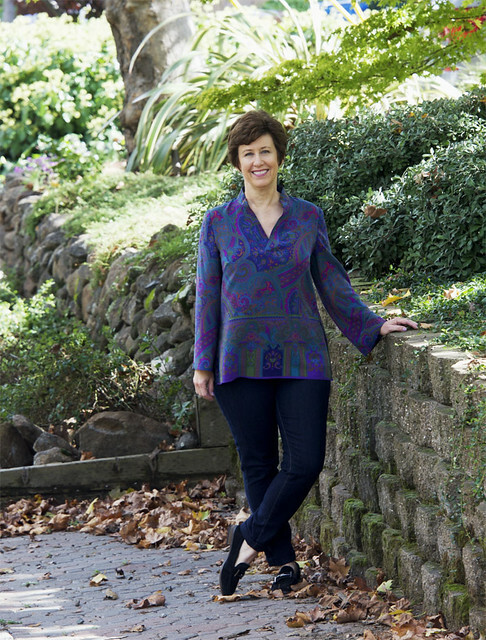 The colors in this top are so perfect for me, saturated jewel tones. The pattern instructs you to topstitch on the placket in rows, which I was not sold on but tried it out anyway on the coral/white silk version. I thought it might give the placket some more substance (on top of the interfacing which it has) and I really liked the effect so I did it again here as well. Back view. 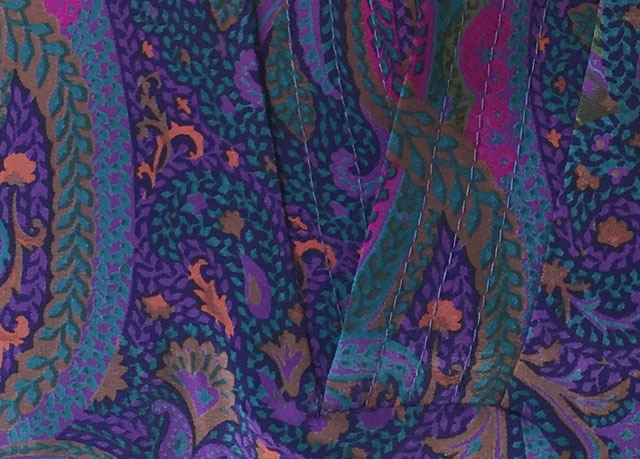 If I had one slight regret on this top is that the border print has one dominant dark purple rectangle, and as you can see I happened to place that right in the center of the back and the front. I don't think it is particularly noticeable in real life but it kind of jumps out in the photos. I carefully planned the length before cutting out as I decided I didn't want any hem, just to use the edge of the fabric. Which worked out, whew! The color in this picture is a little strange, I lightened it up a bit but perhaps all the different shades of green are doing weird things to the overall hue. That is my way too big hydrangea behind me - which is still very green and has a few new blooms. In front of me on the right is the big gardenia which is covered with flowers - so strange for November! Plus a random pink azalea bloom to my left. The garden is very confused this year. I'm also wearing this top in these pics which we took at Metro Textiles in New York, you can see that post here. Next up in my sewing queue is to start in on some of the fabrics I brought back from New York, and actually I think the first item will be the camel color cashmere that Alice bought at Metro Textile. Destined to be a long vest. Plus I have an unnecessary Burda dress almost completed that is a very cute pattern so I will post that soon. It actually will get worn in December because it is a slightly holiday color and then a few knit top ideas are bouncing around. Time to start thinking about gift sewing - if I do any of that this year! Although you can see plenty of fallen leaves in these pictures - it is still the never-ending summer here, I pulled weeds today wearing shorts! So weird. One last bloom from the garden and then it might be the end for flowers for a while. 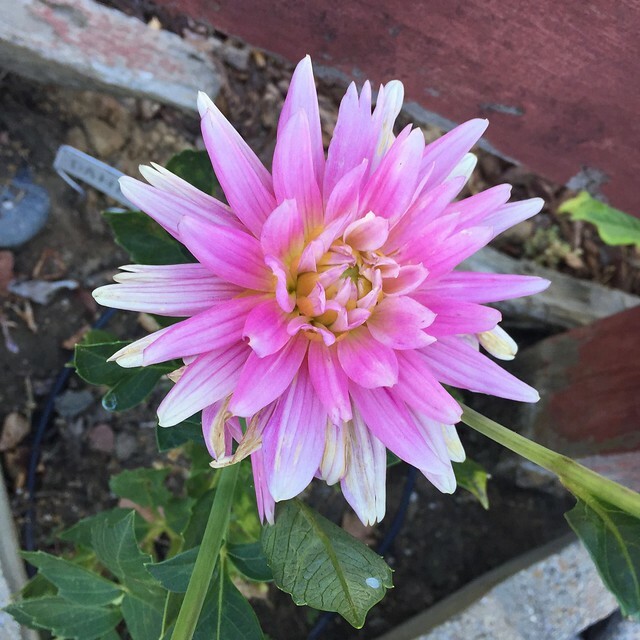 A dahlia which didn't give many flowers. I just pulled up all the dahlia tubers and stuck them in a paper bag and stored them away in the garage. I think that is commonly done in other locations where the ground freezes but it is very helpful here as when it does rain the ground gets really soggy and then they rot. I have stored them this way over the winter previously and it works really well. Thank you so much for all the nice comments on my green wool coat, both here and on Instagram. I really appreciate it and I'm glad that my posts are helpful. There were a few questions left for me about that so here are the answers. First question asked by several people is about interfacing. For starters, I buy all my interfacing from Fashion Sewing Supply, which you can find here. Their interfacings are great quality, they are mostly 60" wide which is a good value and just plain useful, and they have a variety of different weights and types for use with any fabric. For coats I use the Pro-Weft Fusible, either the Medium or the Light. For any blazer try the light - for a heavier fabric used for a coat then try the medium. For facings and upper collars I use the Pro-Sheer Elegance which also comes in different weights, and I use them all. They now have a "Couture" weight which is perfect in silk blouses. I also buy their silk organza and then the knit interfacings too. So that's the scoop on which interfacings. As to where, my sewing motto is more interfacing. I put it on the coat/jacket front, under collar, upper collar, lapel facing, pockets, hems (as shown below). sleeve heads and then anywhere else just seems like it might need it. I also use interfacing to change the entire weight of the fabric, or stabilize a loosely woven fabric (as I did on this boucle outfit for my friend Heather). Lastly on coats, Nancy K asked "does it really get cold enough there to wear this weight of coat?" Let me assure you, YES! However I must stipulate that I am a winter wimp. Meaning that when the temperature goes below 70˚F then I am freezing. Like super chilly all the time from October to March. Here's my typical winter outfit, say for going out to dinner at a restaurant or a friend's house. 1) silk knit camisole 2) cashmere sweater 3) wool blazer or jacket 4) coat on top of that 5) leather gloves and then jeans or other pants plus boots. You might think I was going to the Arctic but as I said I am a winter wimp. When I see women in the wintertime wearing ankle length pant and ballet flats with no socks I just shudder at the thought! Or friends who say oh I don't need a coat - I will just be running from the car to inside wherever they are going. Brr. Anyway - I like to have layers :) although usually I just take off the coat/gloves and then remain reasonable toasty. So back to our temperatures - I do think it gets cold here. OK not Minneapolis or Rochester NY cold but where I live the Jan average is 36˚/55˚ and we get plenty of nights below freezing. Across the bay in SF it is more like 46˚/57˚ and it almost never goes below freezing there - thus the bay area microclimates at work. But if you have been to San Francisco in the summer you will know exactly how cold it can be when the fog is swirling and the wind is on the bay. Hey - I come from a family of weather obsessives and the bay area gives us plenty to talk about, with the temperature at one moment differing by 40˚F over a space of 20 or 30 miles. I wonder if that is the case in any other location? Enough about weather - back to sewing. Let's talk buttonholes. For my green coat I made bound buttonholes. In large part because the fabric is so thick and I actually can't get the coat front under the presser foot to make machine buttonholes. Although I do like the bound buttonholes on that one. But yesterday I posted an image of my Singer buttonhole attachment on Instagram for the #bpsewvember post: Up Close. And some people agreed - it does make the best buttonholes and others had never seen one of these before. This one came with my Singer 401 sewing machine - which I have been using since childhood. It is my sewing machine dream date - the one that never lets me down. Ok I am biased but if you have never sewn with one of these you don't know what you are missing. Anyway - since it is a straight-stitch-only machine it needs attachments to do the buttonholes (and zig zag but I never use that). They work with small cams that create the buttonhole shape, including the most perfect keyhole. 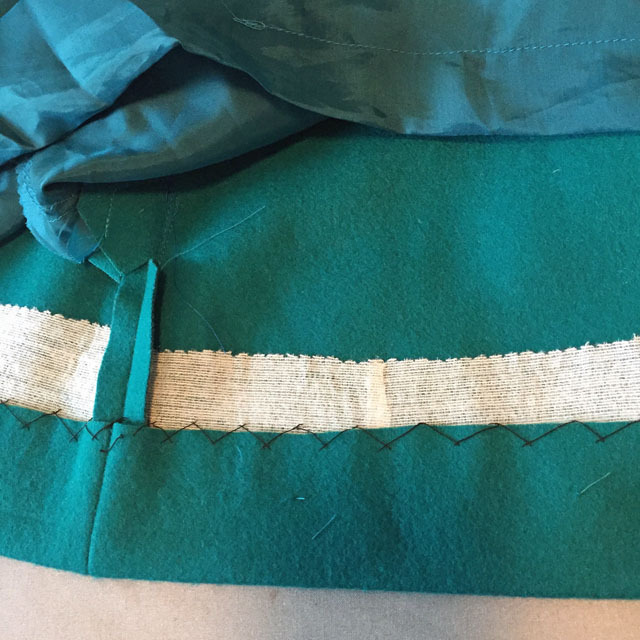 Plus you can adjust the stitch width and go around more than once which gives you the very dense look on a buttonhole that is much more professional looking. Ages ago I did a post about this attachment, and there is VIDEO! 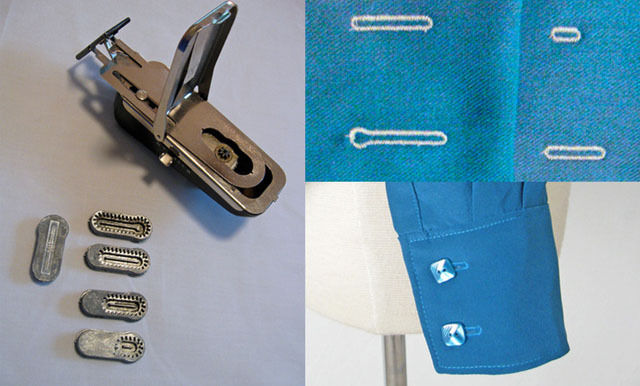 So if you want to see this buttonhole attachment in action check out this post. Video is in the middle of the post. New topic, Pattern chat: What is up with all the poorly sewn samples where people are trying to sell their patterns? I think it is getting worse instead of better. As I have noted before - I am definitely not the target market for most indie patterns, the majority of which are targeted to new or developing sewers who are looking for extensive instructions along with the pattern. So with that stipulated - I would not be adverse to trying a pattern from a new company if I thought the style was cute, but wow, some of the examples are so bad! It makes me doubt their capability if they can't bother to properly press a garment before it is photographed. Also when it fits the model poorly, or the seams are puckered what does that show? That it is not a good pattern if they didn't even do it? Speaking of patterns, lately I have been thinking about perceived value as regards to sewing patterns. Perceived value being the worth that a product or service has in the mind of the consumer. 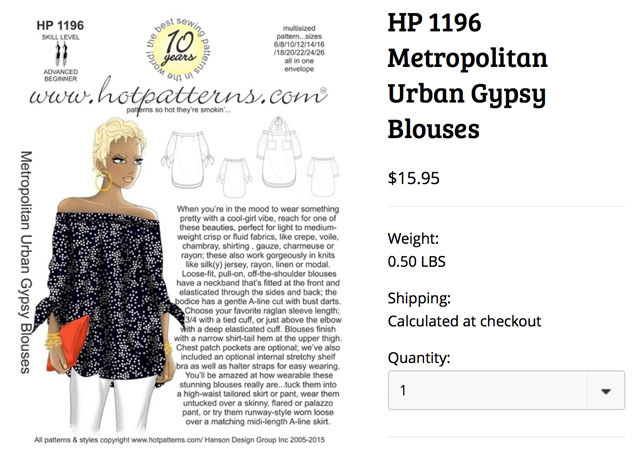 I always comment that I think a lot of indie patterns are very expensive - but perhaps that has to do with the fact that I don't perceive any value in the instructions, the booklet with diagrams, or even the packaging. This is probably entirely different from a beginning or newer stitcher, who can use this pattern to learn techniques along with making a garment. 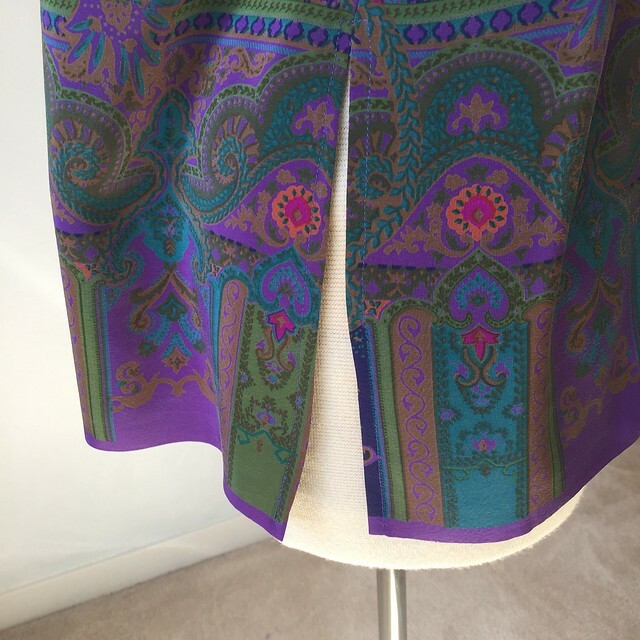 I like patterns with multiple views, like a Vogue or Simplicity pattern that includes multiple garments (for example a skirt-dress-jacket-top or 3 versions of a knit top). To me that is more valuable. I bought one Marfy pattern which was relatively expensive, I think around $ 20 when you include the shipping from Italy. It was just one dress style with no variations, no info on yardage requirements, only the paper pattern pieces, no instructions. Here is my finished dress. After I sewed that I decided it had a high value to me - as there was no tracing involved, the pattern pieces are all cut out and labeled, they did have seam allowances, and fit together perfectly. Also the details in the design were outstanding, especially since it was a relatively simple pattern. So a high value to me and I would buy a Marfy pattern again. What's next on my sewing table? 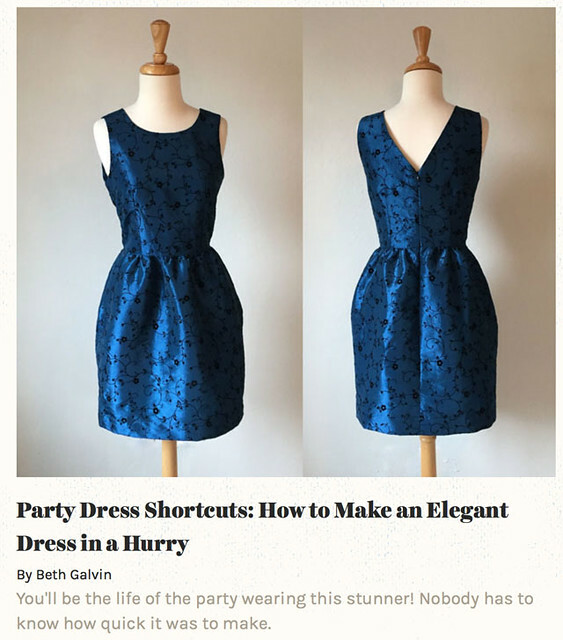 I'm working on some posts for Craftsy, including one on how-to tips for quickly sewing a party dress. (you know the feeling, party invite + irrational need for a new dress because nothing in your closet is just right = late night sewing). Stop me before I make a cape. Why in the world would I make a cape? I dunno, it just looks cute. Plus plaid - you know I love plaid. But I will restrain myself on this one. Along with that thought of following trends, I made this tie-neck silk blouse, as a test version for making it in a different fabric. 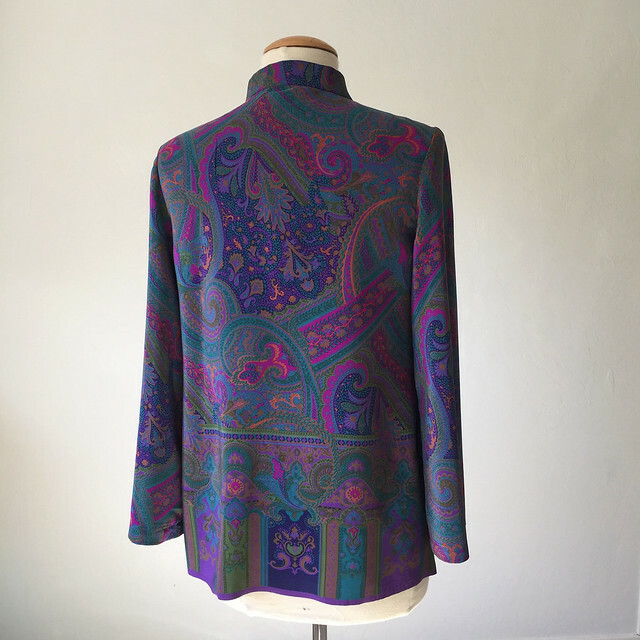 I thought if it worked out I could wear this with my plum wool Burda shawl collar coat. But I don't like it at all, on me. The neck tie just bugs and I probably would be totally uncomfortable wearing it. However I was happy with my pattern work, as I used my standard Simplicity button front shirt pattern and manipulated to create the changes in design. The fabric is a stretch silk charmeuse so it feels really nice. Hmmm, I might just do a giveaway on this one. That's all my random thoughts for today - and I didn't even get to all of them. Such as the Pantone colors for the upcoming seasons - mostly unappealing, why do I look at them? Exposed zippers - I never think they add anything to a design. Pop ups on sewing blogs pestering you to subscribe to their email list, oh, that drives me crazy. That's enough ranting for now :) It's a super sunny day and the garden cleanup chore list is calling my name. Up next a silk blouse that was a total success and may be my favorite item sewn this year. Until then I hope all your sewing is successful! Happy Daylight Savings Time sewing - what will you do with your extra hour tonight? 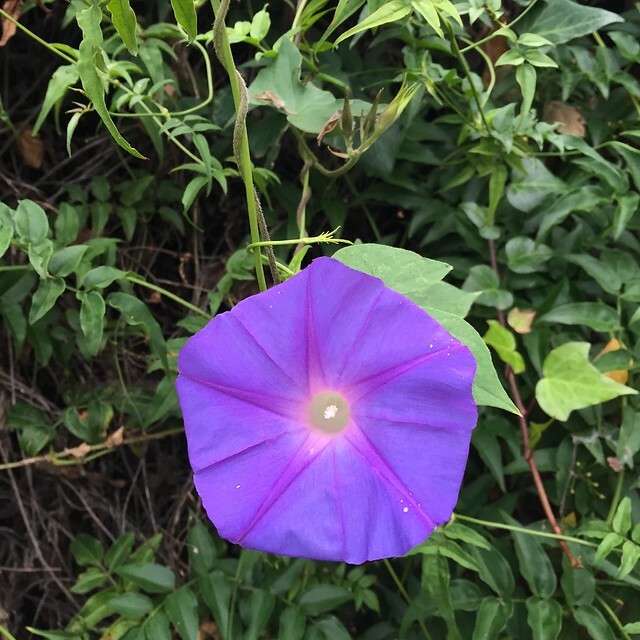 today's garden photo, these morning glories appear at the end of each summer entwining their way up the fence and clinging to the pink jasmine. I love how it looks illuminated from within.